Eclipta (Mohanlian)- Eclipta prostrata L.
Botanical Name: Eclipta prostrata L.
Part Used & Method for Pharmaceutical Preparations: The aerial parts of the plant are gathered in early autumn, dried in the sun and cut into pieces. 1. Deficient yin of the liver and kidneys manifested as early graying of hair, dizziness, vertigo and blurred vision. Eclipta (Mohanlian) is used with Grossy privet fruit (Nuzhenzi) in the formula Erzhi Wan. 2. Deficient yin with internal heat causing extravasation of blood manifested as vomiting with blood, epistaxis, hematuria, bloody stool and uterine bleeding. Eclipta (Mohanlian) is used with Fresh rehmannia root (Shengdihuang), Donkey hide gelatin (Ejiao), Imperata rhizome (Baimaogen) and Cattail pollen (Puhuang). 3. Hemorrhage due to external injuries. Eclipta (Mohanlian) is used alone for external use to stop bleeding. Dosage: 10-15 g (double dosage for the fresh herb). 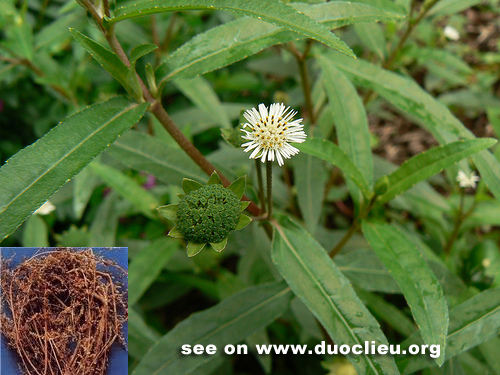 Cautions & Contraindications: This herb is contraindicated in cases with diarrhea due to cold and deficiency of the spleen and stomach.